Poo protests raised its head again when backyarders emptied porta-a-loos at the Our Pride housing project in Eerste River this weekend. 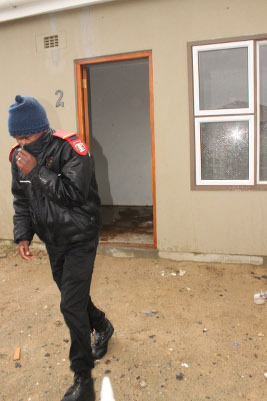 Security guards at the housing project, which experienced forced occupations late last month, fled as about 35 residents led by members of the Economic Freedom Fighters (EFF) threw buckets of faeces in three houses and the offices of the estate agent in an attempt to prevent occupation by eight people who were supposed to move in on Saturday. The backyarders opposed occupation as they believe the Our Pride project was their initiative and they were supposed to be allowed to rent units before eventually obtaining ownership. The group tried to prevent new owners moving in and demanded they vacate the units. Henriette Wenn, said she left her sister to finish moving in when a group of people came to her house and forced her sister outside, making off with the keys to the house. “I only left for 15 minutes, when I came back my sister was thrown out the house and told not to move in,” said Wenn. According to Wenn she and her husband Llewellyn were have been involved with the establishment of the Our Pride project since it started 13 years ago. “The deal was that we were going to have a three bedroom (house), but things changed, the houses built were two room houses. We had several meeting trying to solve the matter, with no luck, the plan was not changed,” she said. Wenn said from the beginning people were told that the houses were subsidisied by the state but would still have to be purchased and buyers would have to apply for a home loan. “I applied first I was not approved, then the second time I was approved. I followed all the right channels, I don’t understand why these people are preventing me from moving in to my house,” said Wenn. The backyards say they refuse to pay the necessary R161, 000 for a house and demand to be allowed to rent the units. Protestor Faith Mamputi said they had information that eight people were going to move in this weekend. “We organised some portable toilets, helped by EFF members. We threw them into those houses because we do not want any one moving in here. And we won’t rest until we get our houses back,” said Mamputi. Protester Bulelwa Makile said backyarders decided to take direct action as talking was getting them nowhere. “We tried all the right channels, Human Settlements, Provincial government, with no help. All we want is our houses and we are not going to rest until we get them no matter what we have to do,” said Makile. Backyarder Heinrich Brits said nothing had ever been said about applying to the bank for a loan and there was no housing agent. EFF representative Lephala Kgomo was not available to comment, his phone rang unanswered. Madizikezala’s spokesperson Bruce Oom said he was aware of threats being made against people moving into houses at the Our Pride project.